There are many free illustration and drawing programs. But there are very few painting program. What I meant as painting programs are those that allows the user to painting as in using natural paint media. Programs such as Photoshop, Photoplus and GIMP may be able to be used for painting. But that is not their main specialty. A true digital painting program must be able to emulate effects such as water colour, airbrush, pastel, oil painting and so on so forth. 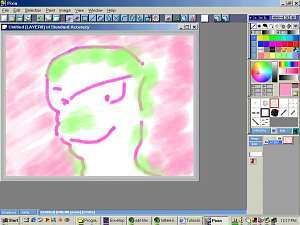 One of the few of such free program is Mypaint. This is a very nice software that supports pressure sensitivity. That means, you can use it with a graphic tablet and the strokes will be natural with thickness that corresponds to how much pressure is being applied to the stylus pen. The closest commercial equivalent to Mypaint should be Artrage which is also very nice and not too expensive. 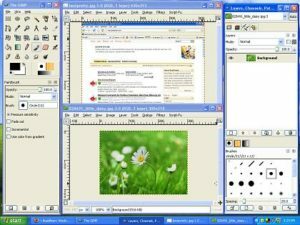 Pixia is a Japanese graphic software. This software reminds one of Corel Painter or even artrage. The major difference from Corel Painter is that Pixia is completely FREE. There are several version that can be found via search on the internet. With Pixia, you can give your photo images a creative and illustration-like feel. In my opinion, this is one of the best freeware for creating images that look like they were created using traditional medium such as water-color. Another beautiful feature of this software is that it can accept photoshop plugin. This greatly expands its compability. Furthermore, many photoshop plugins are freely available on the internet. Pixia comes in an English version. The best image editing and photo retouching software that remained free is the powerful GIMP. It is one of the most popular free image editor. Granted, not everyone like to use GIMP. But I may say, once you get the hang of it, GIMP can do wonderful photo editing. GIMP’s default capabilities can be further enhanced by numerous free scripts and plugins. If you play a lot with photographic filters, you will discover that GIMP can digitally reproduce the effects of many of these filters. Filter effects such as Neutral Density Graduation, Colour and diffuse can all be easily recreated digitally with GIMP. The major weakness of GIMP lies in its inability to work with CMYK as a mode. Because of this, it has limitations in the commercial printing area. GIMP is often touted as the free alternative to Photoshop. However, it should be noted that there are other very capable low cost (not free) alternatives as well. This include Photoplus from Serif. In fact, there are quite a few image editing programs on the market in all price ranges. The software features a browser to view all RAW files within any given directory. It also allows for batch conversion of images to JPEG, PNG and TIFF formats.